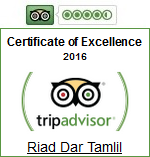 Great Location, Service and Value for Money! We have just returned from 5 great nights at the Riad Dar Tamlil, we arrived at about midnight and were greeted by Abdul with Mint Tea before being shown to our room (no. 2). Much to our surprise an electric heater had been left on and the room was lovely and warm. The room itself was very large with a double bed, bathroom with bath and shower which always had plenty of hot water. Breakfast is served on the sunny roof terrace which consisted fresh orange juice, coffee, pastries along with bread, olives, cheese and jam. The Room was cleaned daily and the communal areas were also impeccably clean throughout our stay. The Riad is very centrally located (about 250 yards from Jemaa el fna square) for all major attractions, but still very quiet and relaxing. We also booked a Day Trip into the Atlas mountains with the company recommended by the riad, this turned out to be a great day with very good English speaking guides, As we expected to be tired after out day out, we booked an evening meal at the Riad which was lovely, Abdul had prepared Moroccan Soup, Beef Tagine, followed by sweet pastries and Mint Tea. All in all, we had a lovely 5 nights in Marrakech, made better by out choice of Riad which benefitted from the attentive service given by both Abdul and Hannan. We look forwrtd to our next visit.